In the end the only real consolation for Steve McClaren was that the heavens did not open in the East End, as they had so infamously the last time he had confronted a side overseen by Slaven Bilic, so the brolly was never required. His players still sunk without trace, utterly incapable of nullifying a West Ham side bristling with pace and inspired by a player over whom the Premier League is already drooling. While the locals departed fifth and chorusing Dimitri Payet�s contribution, Newcastle are propping up the division. These are still early days but some traits remain from last year�s toils. Their dismal form away from Tyneside has yet to be allayed by McClaren�s summer appointment, or the lavish spending of the close season, with this latest loss ensuring it is one win in 11 top-flight games on their travels, and three altogether, this calendar year. Aspects of this feeble defeat were troubling, the manager an agitated figure slamming down his water bottle in frustration and burying his head in his hands when his team�s inadequacies were exposed. If previous outings had seen his team labouring with 10 men, and emerging with credit for their industry, here their full complement were outclassed. The tone for McClaren�s night had arguably been set when the team coach ground to a halt in the gridlock on the Barking Road around an hour before kick-off. His players eventually disembarked amid the roadworks and walked the last mile to the stadium, a request to have the start put back having been rejected, and everything about them was flustered from then on. �Whether it was the journey, late getting here, a 10-minute warm-up � I don�t know,� said the Newcastle manager. �We said there were no excuses but we didn�t deal with it, turning up at 7.35pm. But in terms of organisation, discipline, defending well as a team and being hard to beat � we lacked all that. �We didn�t match West Ham. We�ve got talented players out there but we didn�t do the basics tonight. It�s a process, this is normal. We don�t like going through these types of nights and games. It�s painful. But we have to learn about individuals and the team. We�ve got ability, we�ve got quality. They�ve shown that in the last four games. They didn�t tonight. They�ve been told that was disappointing and they are disappointed. Now they have to dust themselves down and look forward.� Few of a Newcastle persuasion will want to reflect. As an attacking unit they were powder puff � they have not scored since the opening weekend � with Papiss Cissé isolated and neither Florian Thauvin nor Georginio Wijnaldum, big-money summer arrivals, offering any bite or drive. But where they were listless, Payet simply ran riot. At £10.7m from Marseille, the France international already looks like one of the campaign�s bargains, a playmaker boasting that delicious blend of flair, physique and frightening pace. He combined superbly here with Victor Moses, who was making his home debut, and was irrepressible throughout. �He was a player I tried to sign at Besiktas last season and one I really wanted from the start here,� said Bilic. �When it was done in five days I couldn�t believe it.� There will be covetous glances cast towards Upton Park this season. 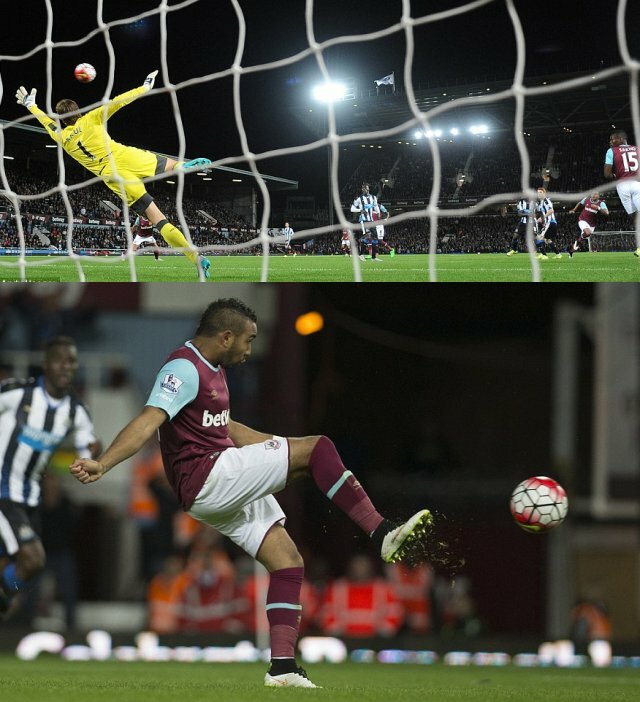 Payet scorched Newcastle early. The hosts� first goal was slickly constructed, Mark Noble stealing back possession from Wijnaldum and exchanging passes with Diafra Sakho, whose smart backheeled return for his captain wrong-footed Newcastle�s players. Their rearguard was pulled horribly out of shape, Jack Colback and Vernon Anita tearing back in an attempt to recover the situation, but Wijnaldum still dawdled. He might have intervened when Noble slid a pass back to the edge of the penalty area but, instead, was caught on his heels. Payet was sharper, the first-time finish from just outside the box curled accurately and emphatically into the top corner with Tim Krul helpless. Thereafter West Ham could seek to prosper on the break, emerging unscathed from slight Newcastle pressure just before the interval � Daryl Janmaat forced Darren Randolph to save at the near post � to settle the contest while the visitors were still summoning some rhythm after half-time. Daryl Janmaat had actually won a promising free-kick from Winston Reid�s challenge but the delivery was wayward, the ball headed towards the halfway line where Moses nodded down, outpaced Anita and held off Massadio Haidara as he tore into enemy territory. The left-back was dumped on the turf as the Chelsea loanee cut back inside and lifted his shot beyond Krul only for the ball to cannon back from the crossbar. While the Nigerian was cursing his luck, Payet composed himself just inside the box and lashed in the loose ball.